Two 4th and 3rd century BC terracotta statues from Athens depicting ancient Macedonians wearing the kausia. Ancient Macedonian soldiers, from the tomb of Agios Athanasios (Greece) wearing the "causia" (modern "pakol") (grave of Agios Athanasios, IV B.CH., before the invasion of India by Alexander the Great. 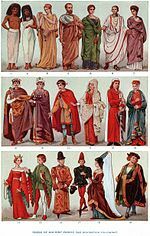 The kausia (Ancient Greek: καυσία) was an ancient Macedonian flat hat. It was worn during the Hellenistic period but perhaps even before the time of Alexander the Great and was later used as a protection against the sun by the poorer classes in Rome. Indo-Greek king Antialcidas wearing the kausia. Japan Currency Museum. Depictions of the kausia can be found on a variety of coins and statues found from the Mediterranean to the Greco-Bactrian kingdom and the Indo-Greeks in northwestern India. 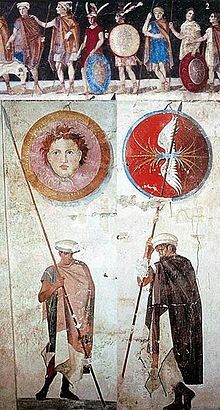 The Persians referred to the Macedonians as Yaunã Takabara or "Greeks ('Ionians') with hats that look like shields", possibly referring to the Macedonian kausia hat. According to Bonnie Kingsley the kausia may have came to the Mediterranean as a campaign hat worn by Alexander and veterans of his campaigns in India but according to Ernst Fredricksmeyer the kausia was too established a staple of the Macedonian wardrobe for it to have been imported from Asia to Macedonia. A modern descendant of the hat may be the Pakol: the familiar and remarkably similar men's hat from Afghanistan and Pakistan. Alexander (left), wearing a kausia and fighting an Asiatic lion with his friend Craterus (detail); late 4th century BC mosaic, Pella Museum. Wikimedia Commons has media related to Kausia. ^ Kingsley, Bonnie M (1981). ""The Cap That Survived Alexander."". American Journal of Archaeology. 85: 39. ^ Fredricksmeyer, Ernst (1986). "Alexander the Great and the Macedonian kausia". Transactions and Proceedings of the American Philological Association. 116: 215–227. ^ Olga Palagia (2000). "Hephaestion’s Pyre and the Royal Hunt of Alexander," in A.B. Bosworth and E.J. Baynham (eds), Alexander the Great in Fact and Fiction. Oxford & New York: Oxford University Press. ISBN 9780198152873, p. 185. This page was last edited on 27 January 2019, at 18:18 (UTC).